Another great first novel! This slim novel in verse uses spare words with such force. Little Matt Pin left Vietnam, been adopted by a loving family but he has nightmares and secrets he hides from everyone. He left behind a birth mother in Vietnam, an American soldier father he never knew and a little brother. In America, he continues to learn about his heritage, but he does not see the beauty and bright colors of Vietnam, only "choking dust, smoke and death"--and aching for his mother and brother left behind. He lives in a big home with parents and a little brother he loves very much, but he is still unsure if they will want to keep him once they know his secrets. His father has practiced throwing pitches with him and Matt wins one of the coveted spots on the team. Some of his team mates resent him because of his heritage. He is bullied and threatened, but he tells no one. Matt also likes to play the piano and his teacher, Jeff, is a friend of Matt's dad. It is Jeff and Matt's dad who bring him to Vietnam veterans meetings and Matt begins to realize many things he did not understand ad the soldiers tell their stories; that his mother loved him and that is why she saved him, that the soldiers made a difference by saving and transporting Vietnamese children to the United States. Once Matt tells his family about his fears, Matt comes to terms with his culture, himself and begins to look forward enjoying his new life, knowing he will one day look for his birth mother and brother with his family. A sad, hopeful novel that teaches us about the Vietname war and how it affected the soldiers, their families, and those left behind in Vietnam. 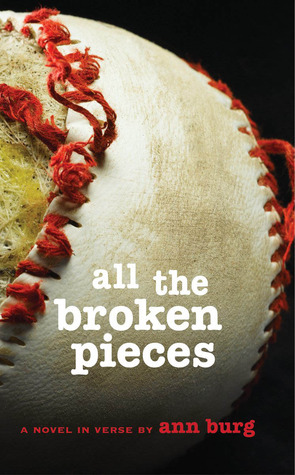 Sign into Goodreads to see if any of your friends have read All the Broken Pieces.